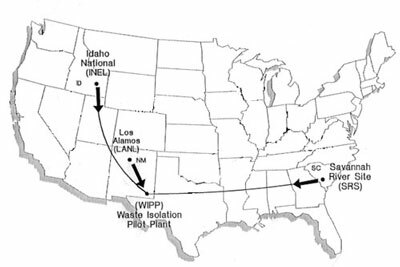 SRIC has a list of Nuclear Waste Documents concerning WIPP, national nuclear waste issues, other international nuclear waste disposal issues. On February 14, 2014, the underground radiation monitors at the Waste Isolation Pilot Plant (WIPP) detected a significant amount of radiation. It was subsequently determined that some contaminants were released to the surface. SRIC opposes DOE's Plan to keep WIPP open until 2050 and dramatically exceed the legal limits of waste allowed. That 2016 Plan was publicly released in response to SRIC's Freedom of Information Act request. (DOE's FOIA response and the Plan.) DOE is in the process of updating the Plan and there should be opportunities for public comment. How does the WIPP Shutdown Impact New Mexico, Idaho, and South Carolina? Beatrice Brailsford from the Snake River Alliance in Idaho, Tom Clements of SRS Watch in South Carolina, and Don Hancock of Southwest Research and Information Center discussed the impacts of the WIPP shutdown in all three states on September 28, 2015 in Santa Fe, New Mexico. November 18, 2015 Presentation to the Northern New Mexico Citizens Advisory Board in Las Vegas, New Mexico. In September 2017, the DOE Inspector General issued a report, Interim Storage of Transuranic Waste at the Department of Energy, that "found that the sites were able to meet their individual interim TRU waste storage needs until WIPP resumed operations." The two administrative orders were immediately made available on the New Mexico Environment Department (NMED) and WIPP websites. However, the detailed explanations of how the proposed fines were calculated were not made available. Consequently, SRIC filed an Inspection of Public Records Act request to NMED and received the documents. NEPA needed before WIPP re-opens  On November 21, 2016, the Natural Resources Defense Council and SRIC wrote to DOE regarding new NEPA documents required before WIPP can re-open to handle more nuclear waste. A Perspective On What's Wrong With and the Future For the Waste Isolation Pilot Plant (WIPP) by Don Hancock Before the Interim Radioactive and Hazardous Materials Committee, September 16, 2014. AUGUST 11, 2014 TOWN HALL  U.S. Energy Secretary Ernest Moniz and other officials spoke at a town hall meeting and responded to some questions and comments. We will provide updates as more information becomes available. If you want to receive these updates via email, send your email address to Info@sric.org. We have received numerous inquiries about the recent serious accidents at the Waste Isolation Pilot Plant (WIPP), specifically the underground fire and the radiation leak. We would like to update concerned citizens about the on-going issues at WIPP, and discuss the expansion proposals for transporting more nuclear waste through New Mexico to the WIPP dumpsite. SRIC, CARD, Concerned Citizens for Nuclear Safety, Nuclear Watch New Mexico, and the WIPP Committee will be hosting presentation sessions for the public to discuss these issues. For further information contact us at sricdon@earthlink.net or call (505) 262-1862, fax: (505) 262-1864. THE GUACAMOLE FUND has coordinated events for public interest organizations since 1974. Money raised from these events support great organizations, including SRIC.